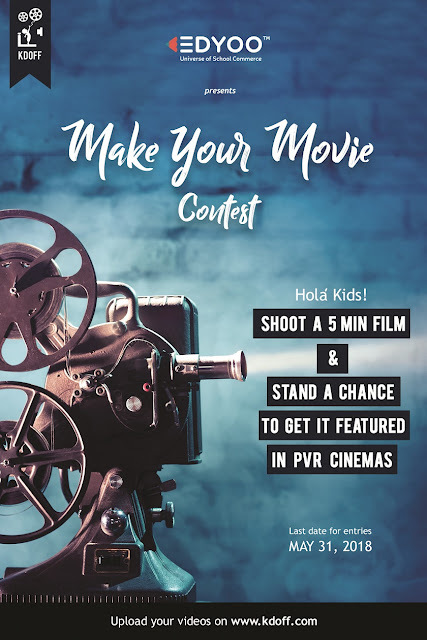 Edyoo Introduces ‘Make your Movie Contest' for Kids | Unkrate | Creating Experiences. Edyoo.com, an online marketplace for parents of school-going children for all Learning, Education, and Development products and services, presents PVR Kids’ Day Out Film Festival powered by Vkaao - from May 19 to June 10, 2018 across 11 cities, including the major metros of Bengaluru, Mumbai, NCR, Hyderabad, and more. In the backdrop of this festival, Edyoo is introducing an innovative category – ‘The Children's Make your Movie Contest', which will allow kids across the country to showcase their movie-making talent, which they can create using their phones or professional video-cameras. The contest is open to three age groups - less than 13 years, 13-15 years, and 16-18 years with the duration of each film being within 1-5 minutes. Entries will be accepted in English, Hindi, and any other regional language including Kannada, Marathi, Telugu, Tamil, etc. Children can make groups of 3-5 to put the movie together. A Special Jury comprising Rakshit Kejriwal, CEO and Co-founder – Edyoo; Varun Agarwal, Founder - Grades Don’t Matter, among other distinguished personalities will screen the entries to decide the winners. The jury will shoot a light-hearted tutorial video on 'Tips on Script Writing and Movie Making' to help the young minds with guidelines to perfect the art. The jury will announce the winners a week prior to the festival and the shortlisted movies will be shared on the official YouTube channel of Edyoo.com. The winning movies in each segment will be screened across PVR theatres during the festival. The winning team becomes a part of the Children’s Jury that shares the stage with dignitaries of the Special Jury during press conferences to be organized across the country. This apart, the Children’s Jury will select the movie to be screened on the day of the festival and have their film screened across PVR theatres as well. Commenting on this innovation, Rakshit Kejriwal said, “Children are our future and the prism through which they view things is vastly different from us adults. The more you work with them, the more you witness their free thinking and unhindered creativity. A contest like this allows them to contribute their point of view to the adult society and express their unbounded thoughts through visuals."